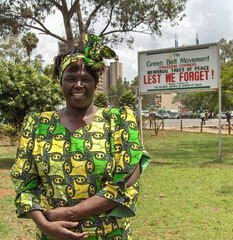 Over the years, GBM and our founder, Professor Wangari Maathai, became internationally known for our advocacy campaigns to preserve public land and forests including Uhuru Park, Karura Forest, and Jeevanjee Gardens. Professor Maathai led GBM’s campaigns on behalf of political prisoners and against politically motivated ethnic violence through the Peace Tent initiative and many other campaigns. We continue advocating for greater political accountability and the expansion of democratic space in Kenya. GBM has called for, time and time again, an end to land grabbing, deforestation and corruption. GBM continues to work on a wide range of advocacy issues in Kenya, often policies in place are in direct contradiction to the efforts to preserve and protect critical forest watersheds. GBM identifies key policy issues to develop advocacy campaigns. Such campaigns would facilitate successful implementation of programs. In recent years, we ran a successful campaign against the production of very thin plastic bags that were one-time use only. GBM has an extensive experience in advocacy, implementing community based projects, conducting community awareness and supporting participatory governance.